There's no FireWire in the Saffire 6. PRESS RELEASE: The Focusrite Saffire 6 USB is the latest in Focusrite's new generation of audio interfaces, its most affordable to date, and the best-sounding interface in its class. Alongside the two Focusrite pre-amps are two balanced TRS outputs and four RCA phono outputs. Four phono outputs, high-quality digital conversion, a high-level headphone output and flexible monitoring solutions make Saffire 6 USB ideal for digital DJs. The converter performance ensures that the quality of the audio streamed from the computer is sonically superb. An A/B source switch for monitoring either of two stereo output pairs and the high-level headphone output provide all that's required for Laptop DJ-style cueing in a club environment. Focusrite's established Xcite+ bundle is also included. The bundle features Ableton Live 7 Lite (for all your production, performance and compositional needs), Novation's Bass Station soft synth and over 1GB of royalty-free samples from Loopmasters and 'Mike the Drummer'. 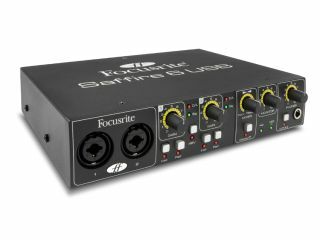 Focusrite's Saffire 6 USB is designed to just work in the background and sound great. It captures and streams every detail of your sound, flowing seamlessly and effortlessly in and out of the digital domain, leaving you free to enjoy a carefree modern music making experience.